I overslept and missed the opening, but luckily I was able to find George without too much trouble about 10:30a. As Giants FanFest is free, there were THOUSANDS of people swarming AT&T Park. Everywhere you looked there was a line for something – to get onto the field, to get an autograph, to get free stuff, to get food. George and I stopped by the street banners sale first and he picked up an Opening Day banner. I almost got one myself, but there were no more Posey ones, so I had to pass. We headed up to the View Reserve level as there were three autograph stations there. By the time we found the first one, the line stretched at least three ramps down. George had told me that there is no control over who you might get when waiting in any of these lines and that the good players rotate out early. Sure enough as we decided not to wait and walked back to the top, Brandon Crawford, Barry Zito and my guy, George Kontos, exited the booth to head to their next stop. I was four feet from Kontos and was so mesmerized I didn’t even try to take a photo! Oops! We wandered around the View Reserve level, taking in the crowds on the promenade and on the field, marveling at the waits those fans were enduring for those autographs. We made our way downstairs and ended up on the Virgin America Club level. 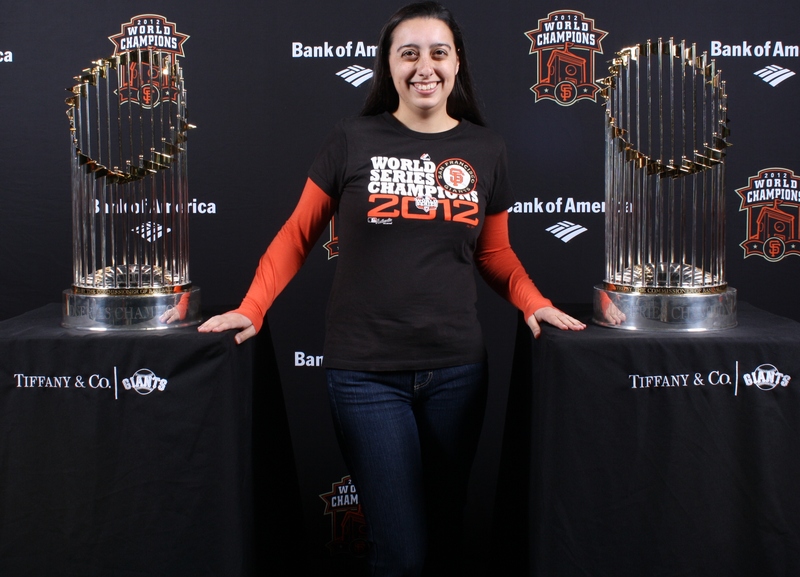 It was there that they were hosting a Q&A with none other than Madison Bumgarner, Bruce Bochy and my guy, Brandon Belt. Having just walked in on the event in progress, we were at the back, so I could barely see and couldn’t get a decent photo, but it was awesome to see the Baby Giraffe in person. The first question we heard was from a little kid who asked Brandon what his favorite moment of the World Series was to which he responded, “After going like 0 for 50, getting that first hit in that last game.” The crowd screamed and cheered for him and it felt like we were back at a game. Someone else asked Madison how many homers he thinks he’ll hit this year and he responded, “I’m going to go after Barry’s record this year,” which made everyone laugh. After wandering the Club level for a bit, we decided to make our way onto the field. It was a bit of a crush to work our way down the stairs and then to thread our way through the various lines of people waiting for different autograph booths. As I did when I completed The Giant Race, I had warning track dirt in my shoes and I loved walking across the outfield grass. We spent most of our time in Right Field, such a vast stretch of lawn that Hunter Pence runs around crazy person. Trophy photos taken, George and I stopped at the conveniently placed food truck, The Melt. I got the last s’more sandwich in addition to my regular sandwich and it tasted divine! It was a lot less messy than the one that Akemi and I shared at AT&T Park last season, which helped the deliciousness factor as well. We enjoyed our lunch at the edge of McCovey Cove and watched a couple of middle-aged guys throwing boulders into the water to try to retrieve their baseball that had fallen in there. They did finally retrieve it, but continued to play catch, which seemed a little ridiculous to me. A quick trip to the Dugout Store to confirm that they STILL don’t have any Belt shirtseys and our FanFest experience was at an end. I don’t regret not standing in line for autographs, though I do wish I’d been able to snap a photo of Kontos and Belt when I saw them. I wish Giants FanFest was a bit more like SoxFest, with wristbands for autograph lines and designated times for all the activities, but then it wouldn’t be free anymore. Next year, I’ll do a little more planning to grab all the free swag, and then I’ll have a nice picnic lunch in Right Field, enjoying the feel of the grass and keeping an eye out for those AT&T Seagulls.